This is just a small pre-pre-alpha technical demo, not a proper game. There isn't much gameplay here; mostly it just showcases a work-in-progress engine and some custom graphics (my own set based on LTTP, but with some adjustments for ease of use and some new elements). The tiles also contain a small amount of suggestive fairy poses (sometimes in swimsuits); viewer discretion is therefore advised. (The potentially offending content is on pages 175-190). I built this for a prospective future quest with the working title "Memory of Koholint". However, this is all I've got done for it besides a messy stack of plans, although it will also reuse or expand on several elements from my previous quest, Link and Zelda: Panoply of Calatia. Essentially, Memory of Koholint aims to be a sequel with similar gameplay, but with less ties to Zelda II and more to Link's Awakening and A Link to the Past. However, I'm waiting to post a proper project page for it until there's more actual content done, instead of just rambling about my plans. The quest file is not passworded and the scripts are included, so anyone who wishes to tinker with this (or attempt to repurpose it) may freely do so (though I cannot promise to assist such efforts, you can always ask). It has a lot of limitations, though; most standard ZC features don't interact normally, and there are no enemies yet. Also, it might or might not be properly supported by newer betas as time goes on. Does this run okay? I'm unsure if it may cause lag compared to other quests, due to the complexity of the screen drawing. At last, the high-tech futuristic graphical capabilities of Final Fantasy IV are mine to command! Wait, I thought I was done underselling; oh well. This is far beyond even your high standards, Mitsukara. The way the waves bounce as you goi along is a nice touch. The animation as you enter a cave/warp is astounding. Having the ability to use items while rafting is neat. Looking forward to a more complete version! Pretty cool! The raft's a bit sluggish moving north and south (made jumping bombs pretty difficult to judge) and the cramped field of view makes navigation a pain, but as a tech demo it's impressive! Good stuff. Amazing stuff! Possibly stupid question. Can this switch back to regular ZC mode when you disembark? I guess you haven't tried it out yet. XD Yes, it switches back when you disembark. This is so far beyond anything I've seen in ZC, and that's including the stuff blueknight was working on a while back. The only thing I might change is maybe have the horizon be up one more tile or so, so there's more north/ south room. Otherwise, wow, I can't think of anything else to say. It looks great, and the LttP style Marin sprite is really well made too. Also, how do you jump? I think I've pressed all the buttons. Find Roc's feather and equip it. Wow, I am really impressed by this. You've definitely pushed the limits of ZC and made something I wouldn't have ever imagined. Firstly, this does run very well. I experienced no lag or any other problems like that, so well done with that. I don't think I have any major problems with the tech demo, except for jumping over bombs vertically. 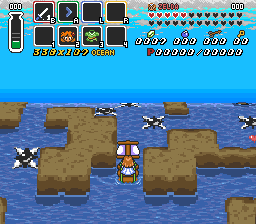 Doing this horizontally is not a problem at all, but with it vertically it can be really hard to determine how far you are from the bombs in the water, so I always ended up blasting myself because of the depth perception. I think that could probably be worked on a little bit. Maybe like what others have said, increase the horizon up a bit, just to make things easier to see. Anyways, this is amazing and I would love to see more of this. Great job! That was a friggin experience. Praise be. Also, I noticed you'd used my palm tree at the End of Demo Fairy's fountain. I am truly honored to be included in all that Mode 7 goodness. Edited by Geoffrey, 05 November 2017 - 09:49 PM. That's weird. Perhaps you're experiencing a controller/keyboard problem? Both buttons work for me. I definitely hope to set up item puzzles that work in this format, of course. But I still need to have it identify 'where' your weapon is compared to the map; I was messing with a thing to make the boomerang blow up mines, but the math on identifying it's position was confusing me and didn't work out in time for the demo. I agree that a bit more vertical range would make this a bit better, and perhaps I should zoom it out some. I'd have to refigure my math a bit to adjust that stuff correctly, since I didn't devise a way to easily adjust it smoothly on the fly or anything (though I'd like to), but it should be possible. Failing that, I think I would avoid having the player worry about vertically hoping over mines in an actual game if I use it with this perspective. I may do well to look into your tileset, though; so far everything I've used here is either edited out of Orion's LTTP tileset, grabbed directly, modified from Parallel Worlds, or something I drew/edited myself. 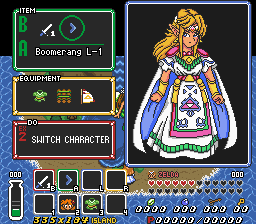 (Although the beach waves are from BS Zelda, and the white rock pattern is modified from BS Zelda to fit a lower-shading palette). I had some ideas about having her involved as a sort of costume-changing mascot for a level-up system, and maybe other things. I'd like to make multiple versions (the basic design for each set can be found on one of the tile pages), with a male fairy (in much the same poses, hehe), different outfits, and so on. Also the overweight fairy from LTTP, though I decided to replace her face because I couldn't stand trying to draw more animation frames with that weird creepy face the original had. (I also redrew the other fairy's face a bit to be cuter and not have yellow lips). Pixel art is one of my big hobbies, and I have some plans and sketches for a webcomic with more suggestive content like that (not the overweight thing, but the rest of it), and similar sorts of things I've made now and then. At the very least, I want to complete the primary 'green' outfit for the male version, the male bikini/speedo version, the main overweight version, and the goofy Sailor V and Nephrite costume versions (because I'm completely obsessed with Sailor Moon). the LttP style Marin sprite is really well made too. Thanks! ^^ She's not completely done (that's why she doesn't charge up the sword like the others; not that I necessarily intend to have everyone using the sword in the final game anyway but we'll see). 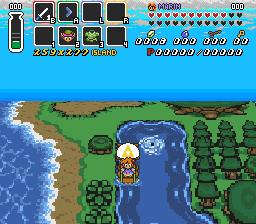 There's this weird problem with original LTTP Link where he's slightly 'taller' facing sideways due to how the head sprite positions on his body and how he uses the shadows, so I've had a hard time figuring out how best to align Marin (and to a lesser extent Zelda, since Zelda needs a lot more sprites than she had originally). I am also messing with redrawing Link and Zelda's hair a bit (and maybe height but I'm not too sure about that part) to closer resemble manual art, and have various experiments in the tileset around page 123 I think. If I do that, I would keep copies of the original sprites, and ideally I'd like to let the player choose which to use, but this is all a bit hypothetical for now. If anyone wants to use the Marin sprites (or my other custom sprites), feel free, by the way. Credit is nice though. I'm pretty sure I could use part of what I scripted here to make a thing that uses the same collision detection logic minus the mode 7 tilted look (so just regular overhead scrolling), and be able to use items much more easily with that. (and make enemies and weapons/items scroll around a little the way I did for the tunnel rooms in Panoply of Calatia). 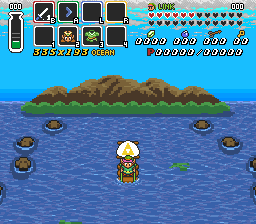 So I may try that first, and then wind up only using the Mode 7 thing in a more limited capacity, like for a Zelda II type worldmap. I'd still want at least some items for this mode 7 mode though, like keys, bombs, flute warps, a salvage arm, etc. I also had an idea about having random encounter monsters in that format... we'll see what works out. Thanks to everyone for trying it out and giving feedback! I'm relieved to hear it doesn't run like an anvil full of molasses. That's high praise, but I think perhaps a bit too high, since you might've missed the little fact that Blueknight made full-on 3D raycasting in ZC somehow. So I don't think I'm quite up to that level : ) As a tradeoff, I hope to remain extant within this mortal realm. Edited by Mitsukara, 07 November 2017 - 07:53 AM. They used some mountains of mine in that hack too so the creators are definitely aware of PZC. If Geoffrey's trees are in the database then I wouldn't be surprised if they made their way into Parallel Worlds. Yeah it's a shame he disappeared. I was helping him out with that project and it was looking not half bad. But not all was lost - in fact the Zols I drew for that quest ended up getting downsized and used in Linked Seasons! WHAT HAS SCIENCE MITSUKARA DONE?! Alright, so this basically proves that ZC can be used as a shell to create an engine within an engine. Mind blown. This is so far beyond Z3 scrolling. The only thing I could possibly suggest is stretching out the horizon line a bit. It's very smooshed at the top, and as the scenery scrolls down toward the much more expanded bottom, it tends to look the world is wrapped around a rolling pin rather than scrolling along a flat surface. The reason I suggest moving the horizon line upward a bit is that, in photography, they insist on dividing the vertical element of such imagery into thirds instead of halves so that you can favor one part of the image over the other. Take a look at this writeup for multiple photographic examples (a few going as far as sixths) and an explanation of why this is done. I realize you could argue that the subscreen might serve as the cutoff point, however I believe its transparency alone overrides that position, and further, raising it a bit could help with the smooshed look up there that makes the scenery look more round than it should. Also, I like how optimistic you are about the release date. I'm pretty sure 20-anything would be beyond my scope.